For the great majority of students in the United States, there is no escaping standardized tests. Whether they're used to measure your child's academic growth or part of entrance requirements for universities, your child will most likely come across them at least a few times in their academic journey. Because of this, it's important that they know how to prepare for them. These tips can help them be better prepared. 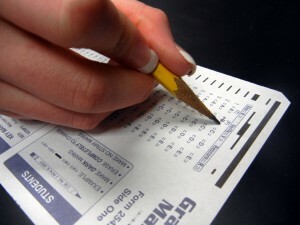 To start, your child should know when they will be taking a standardized test. This will give them some sort of deadline which they can use to plan their studying. If your child doesn't know what will be included in their test, have them ask their teacher for a bit of guidance. This will help them avoid wasting time studying lessons that won't be included in the test. Have your child study daily so that they can avoid the stress and anxiety that comes with cramming. Finally, ensure your child gets plenty of rest the night before their exam and has a healthy breakfast before heading out the door. Standardized tests can really stress out some students, so take some time to ensure your child is prepared with test-taking strategies. To start, remind your child to read the directions completely before getting started. They should do the same with every question before selecting an answer. Identifying keywords in the question can also help make the answer easier to select. If your child gets anxious and has trouble focusing during tests, teach them breathing exercises and other techniques that will help them overcome these hurdles. Finally, teach your child to manage their time so that they are able to answer as many questions as possible without rushing. To help your child prepare for their exams, consider enrolling them in tutoring in Powder Springs, GA. To enroll them in an effective academic program that will help them reach their academic potential, contact The Tutoring Center, Powder Springs GA. Give them a call at (770) 222-7133 to learn more.